You are able to create either letters for a group of students or just individual letters. These letters are available for any borrower serviced by Nelnet, along with those serviced by EdFinancial, Granite State, OSLA, and VSAC. Click here for a step-by-step guide to creating these letters. On their own, Nsight Plus’ letters are valuable default prevention and management tools. However, combined with the appropriate Nelnet resources, we think these letters could be an especially powerful tool for your institution. By using our letters in tandem with our resources, borrowers will not only be informed of their loan status, but they will also receive a brief, to-the-point education on topics critical to them in their current status. This is the third article in our series that looks at how to effectively package letters from Nsight Plus with Nelnet’s resources. In previous articles, we have addressed how to use the Deferment Ending and Forbearance Ending letters. Every borrower’s situation is unique – their loans could be past due for a variety of reasons. No matter the reason for delinquency, it is important to make sure borrowers fully understand the serious consequences of default. It is just as important that they know how to correct their situation. We have two resources available that address these specific topics. How to Avoid Delinquency and Default on Your Student Loan reminds borrowers what delinquency and default are, lists consequences of default, and briefly describes how delinquency and default can be avoided. Four Easy Ways to Avoid Delinquency or Default on Your Student Loan points out ways borrowers can connect with Nelnet to take action on their loans. 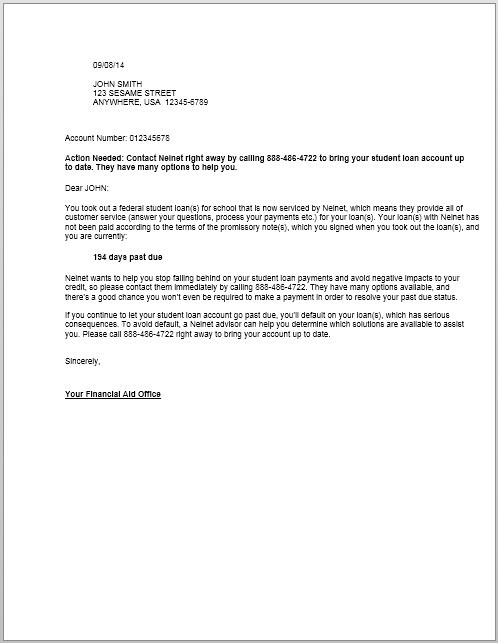 By including these resources when you send borrowers their X-Days Past Due letters, you can help them avoid default and identify a repayment plan that works for them. To sign up for Nsight Plus and start integrating our letters into your school’s default prevention plan, click here. For a look at more useful resources, visit our library.